Everyone knows my love for baking and all things sweets-related, so when I got asked to make one of my best friend's wedding cakes, I jumped at the opportunity. What an honor, and so exciting to be a part of their big day! Don't get me wrong, though- this was a huge undertaking, and I had not baked on this scale before, so practice rounds were definitely required! I researched quite a bit, and was not surprised to find that Deb of Smitten Kitchen had published several posts with steps detailing her own "Project Wedding Cake". These became my wedding cake bible, through her trial and error, and attention to detail, I was able to gain the confidence I needed to tackle my own project wedding cake! I did a tasting for the bride and groom so that they could decide on flavors, and we ended up going for a classic vanilla buttermilk cake, with raspberry compote and salted coconut caramel fillings (one for each tier), all finished with luxurious Swiss meringue buttercream! The decorations were to be simplistic, with a rustically finished frosting along with florals and greenery from the farm where the wedding was taking place. This calmed my nerves a bit, as I am not one for the tiny, meticulous, perfectly designed cakes. Luckily the rustic look fit in perfectly with the entire vibe of the wedding. I've linked to Deb's posts below, since I only made minor changes to her stellar recipes, and included my own for the fillings as well. One word of advice I can give is to prep and get certain things done ahead of time if possible! My husband's catering company Beck & Call was doing the food for the entire wedding weekend, so I knew he would have his hands full and couldn't expect much help. Not to mention I was a bridesmaid in the wedding as well, so had plenty of other "duties" and fun things to tend to. My planning and organizing skills really came in handy here, and I can safely say after successfully finishing my cake that I had a blast doing it, and look forward to making another! My layer cake recipe comes from the super-talented Deb of Smitten Kitchen. This one in particular is for a classic birthday cake, but she also makes a wedding cake as well. They both use the same ingredients, just in different ratios, and I ended up using the birthday cake recipe because it yielded a bit more, and was easier to convert into different sizes for multiple tiers. The recipe makes three 6" round layers for the top tier of wedding cake, so for the bottom tier, scale recipe up (multiply everything by 1.5) to get three 9" round layers. I weighed about 560g per pan for 6" layers, and about 750g per pan for 9" layers, so ended up with some leftover batter for a couple mini loaf cakes! Feel free to make the layers as thick as you want. Once the cakes are fully cooled, I suggest wrapping and freezing each layer before assembling and frosting, as they are much easier to handle this way. That way you can make the cake layers a couple days early to get this step out of the way! You can also level each cake (remove the dome shape at the top so as to create flat surfaces for stacking) either when they are fully cooled before freezing, or once they're frozen and you're ready to frost. Other than that, go check out Deb's recipe for fool-proof vanilla layer cake here. I wanted to use Swiss meringue buttercream as the frosting for my cake for multiple reasons. First, it's not sickeningly sweet like the frostings most of us are accustomed to. It also holds up extremely well in warm temperatures, and since this wedding was taking place outside in New York in August, that was definitely something to consider. And finally, it is super smooth, making it perfect for piping, and doesn't end up crusting like many other frostings do. It's all about the butter here, so use a high quality one if you can! And, surprise- this recipe also comes from Smitten Kitchen. Even Deb seemed to have some worries about the supposedly tricky Swiss meringue buttercream coming together, but rest assured that it will! It just takes a bit of time, and at some point may look too runny or curdled, but not to worry. Continue mixing for about 15 minutes, and it all work out nicely. You can make this a couple days ahead if need-be, just store in the fridge in an airtight container. Before you're ready to frost, let it come to room temperature, and then re-whip buttercream in the mixer until it's smooth and glossy. Get Deb's recipe for Swiss meringue buttercream here. At the tasting, the bride and groom sampled both a fruit and caramel-type filling, and ended up loving both! Since the cake was to have two tiers, we decided to do the raspberry compote in the layers of one, and the salted coconut caramel in the other. I suggest piping a circle of buttercream around the outer edge of each layer before adding filling, so that it doesn't spill over the sides! Fillings are another key component that can be made ahead of time, thus saving you time for assembling on wedding day! To prepare raspberry compote, cook raspberries, sugar, cornstarch, and water in a small saucepan until the berries start to break down, about 10 minutes. Lower the heat and simmer until the compote is thick, about 5 minutes. Remove from heat and let cool completely. Store in an airtight container in the fridge (this can be made a week ahead of time). Makes 1 cup. Heat sugar in a saucepan over medium heat, stirring constantly with a wooden spoon. Sugar will form clumps and eventually melt into a thick brown, amber-colored liquid as you continue to stir. Be careful not to burn. Once sugar is completely melted, add the butter tablespoon by tablespoon. Be careful are the mixture will start to bubble. Stir the butter into the caramel until it is completely melted, using a whisk if necessary. Slowly pour in coconut milk while stirring, taking care as the mixture bubbles and may splatter. Allow the mixture to boil for 1 minute. It will rise in the pan as it boils. Remove from heat and stir in salt. Allow to cool down before using. You may make this in advance and store in an airtight container in the fridge for up to one week. Makes 1 cup. Here comes the fun (and slightly terrifying) part! Once all the cake layers are baked, fillings are made, and buttercream is whipped to glossy perfection, it's time to assemble your wedding cake! The assembly and decoration stage is where all your fun cake accessories come in handy! Cake boards, piping bags, decorating tips, offset spatulas (in multiple sizes), a pastry comb, a rotating cake stand, and a cake carrier are all important tools that played a big part in my cake's success. I definitely suggest looking into these as they make the entire process easier, especially for an amateur baker like myself. I like to use a bit of buttercream underneath the base layers to "glue" them to the cake boards. This will make things more stable and keep them from sliding around! While stacking the layers, giving them a spritz of simple syrup will ensure the cake stays moist until serving time. After filling your layers (remember the ring of frosting around the edges to keep the filling from spilling over! ), I strongly suggest adding a "crumb layer" of frosting to each tier. This thin layer doesn't need to be perfect by any means, but it will keep those inevitable crumbs where they belong- on the inside layers and not at all visible on your pretty, final product! Just allow the crumb layered tiers to set in the refrigerator for at least 30 minutes before attempting to frost with a full, thicker layer of buttercream. At this point, the pastry comb came in handy, and its several design options truly helped me look like a pro! A few flowers and greenery from the farm, et voila! Be patient, take it one step at a time, and always remember- buttercream can cover a multitude of sins! I've had a love affair with sticky toffee pudding for quite a while now. This British dessert made from dates and toffee sauce is less a pudding (by American standards), but rather a rich and gooey cake. Since I was in London last week, I took the opportunity to seek out and indulge in a few versions of this local dessert- all in the name of research, of course- so that I could recreate a worthy version at home just in time for Easter brunch. Sticky toffee pudding is seriously decadent, super unique, and utterly delicious, making it the perfect Easter dessert in my book. It's best served warm out of the oven, so if you need to bake the cake ahead of time, just wait to poke holes and pour the sauce over it until just before serving. Cover and reheat at 300ºF for about 20 minutes. While this cake is super delicious as-is, a little ice cream or whipped cream never hurt anybody, right? Throw on some toasted nuts and the rest of the warm toffee sauce, and you'll be adding this to your dessert rotation in no time! Preheat the oven to 350ºF and butter an 8 1/2 or 9 inch square (or round) baking dish. Place chopped dates in a heat-proof bowl, and cover with the boiling water. Mix in baking soda, then set aside to let soften. In the bowl of a stand mixer, beat the butter and sugars together until light and fluffy. Gradually beat in the eggs, then the vanilla until fully combined. In a separate bowl, sift together the flours, baking powder, and salt. Slowly add the flour and date mixtures to the stand mixer, alternating 1/2 of each at a time. Careful not to over-mix. Pour the batter into the baking dish and bake for about 45 minutes, or until a toothpick inserted into the center comes out with some moist crumbs still attached. Remove from the oven, and let cool a few minutes. While the cake bakes, make the toffee sauce. Bring the butter, cream, brown sugar, vanilla and salt to a boil in a saucepan, then lower to simmer. Whisk or stir constantly for about 10 minutes until sauce thickens and coats spoon. Remove from heat and set aside. While cake is still warm, poke several holes over the entire surface with a chopstick. Pour toffee sauce over top of the cake, spreading it around evenly and allowing it to be absorbed into the cake. Repeat another time, leaving about 1/4 of the sauce for serving. If desired, turn oven to broil and return the cake to the oven for just one minute for extra caramelization! Careful not to let it burn. To serve, you may cut squares, use a ring-mold, or simply spoon portions of the cake into serving bowls. Top with additional warm toffee sauce, whipped cream (or ice cream), and toasted pecans. 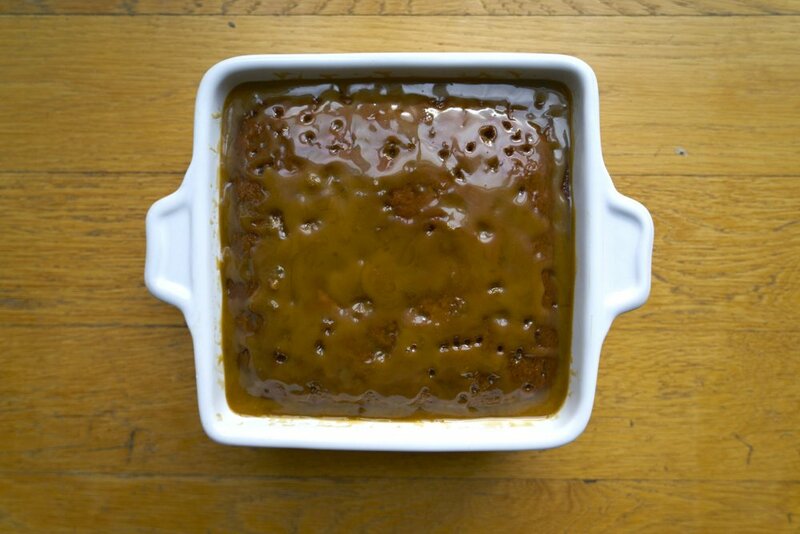 *Adapted from Date Cake with Toffee Sauce by Smitten Kitchen and Warm Sticky Toffee Pudding by David Lebovitz. I love pretty much anything and everything involving chocolate. I also love beets. Now, I know what you're thinking: Beets in a dessert? Really!? But trust me on this one. The beet purée gives this cake a super moist crumb and rich texture, while the flavor remains über chocolatey. It's seriously decadent and oh-so indulgent, making it the perfect dessert for Valentine's Day, or any other date night! To top off this tasty cake, I add some sweet and crunchy pistachio brittle. I make mine with honey, so it's more like a cross between candied pistachio and brittle, but without the hassle of corn syrup or a candy thermometer! Add a dollop of whipped cream or crème fraîche, and you have yourself a seriously delicious dessert! Bonus points for sneaking in a vegetable too! Keep in mind, you can also make this cake ahead of time, as it tastes even better (if that's possible!?) the next day once it's had a chance to fully set. Enjoy! To serve, dust confectioner's sugar and ground pistachios over the entire cake and top with big pieces of pistachio brittle. Slice and serve each piece with a dollop of whipped cream. Enjoy! *Adapted from "Extremely Moist Chocolate Beet Cake" from Tender: A Cook and His Vegetable Patch by Nigel Slater. 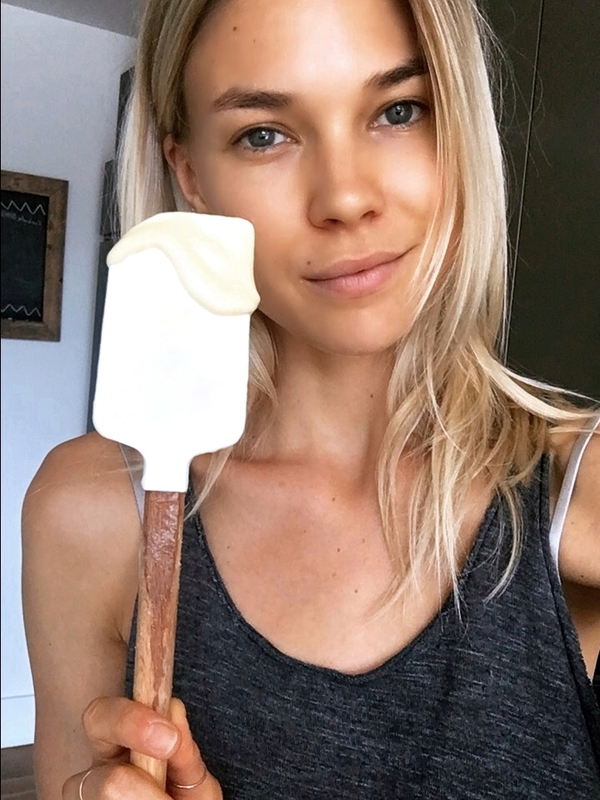 **Check out Britt and her recipe featured on Garance Doré. Photos by Pia Moore. I'm typically in charge of dessert for my family's holiday dinner, a task I take on with joy. There's always plenty of cookies around from the cookie exchanges my mom attends, so I wanted to do something a bit different. After a bit of browsing and research, I came across this Dark Ginger Rye Cake with Yogurt and Honey by Andrew Tarlow in Bon Appetit. I absolutely love the warming and comforting flavors of molasses, ginger, and cinnamon, and was intrigued by the addition of rye flour. I made a couple of changes, INCLUDING Using a dollop of honeyed yogurt as the topping adds the perfect balance, and keeps things from getting too sweet. Because of that, this moist cake works equally as well as a breakfast or brunch cake. I love the rustic nature of the cake, so feel free to break it into pieces rather than slicing if you prefer. Regardless of when or how it's served, it's sure to be a crowd-pleaser. Get the recipe here!